Today as we celebrate the life and legacy of Dr. Martin Luther King, Jr., my mind easily goes to the topic of leadership. On this day we pay tribute to the life and work of one of the greatest leaders the world has ever known. In what is often referred to as the “I Have a Dream” speech, there are some profound insights into what it takes to be a truly great leader. Great leaders refuse to accept the status quo: In fact, I would say that this is the defining characteristic of real leaders. They are not indifferent; they are active and unwilling to agree to their status and circumstance. Great leaders do not sugar-coat reality: This speech came at a critical point in the civil rights movement. Dr. King did not pull any punches. He faced the most brutal facts of his current reality. Great leaders engage the heart: While logic may require the mind, stories and metaphors move the heart. This is the difference between sharing information and inspiration. Dr. King was a master of captivating hearts. Great leaders call people to act with their highest values: It would have been easy for the civil rights movement to change strategy and resort to violence as some did. However, just like Nelson Mandela when he became president of South Africa, Dr. King called people to a higher ground. Great leaders refuse to settle: It would have been easy for Dr. King to surrender his principles and to have settled for less than his vision, but he was stubborn in a good way. He was persistent and called people to persevere. Great leaders cast vision and hope for a better tomorrow: Leaders can never grow tired of sharing their clear and relevant vision. They have to help their followers see a vivid picture of hope as Dr. King did so effectively. The “I Have a Dream” speech is full of lessons in leadership. In the spirit of this holiday, take time to sit down with your family and read or watch the entire speech. You may find it on YouTube. It will change forever the way you understand Martin Luther King Day. 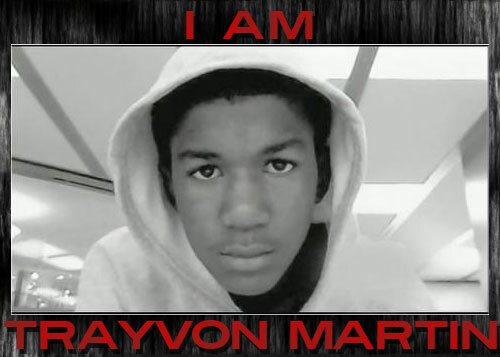 For me to join the masses right now and voice “I am Trayvon Martin” would be presumptuous for an old white guy to say. I cannot know what it’s like to be under constant surveillance and suspicion just for my skin color. I have witnessed how some white folks watch black folks with automatic suspicion anticipating violence or stereotypical behaviors. I’ve also witnessed racial violence, and both personally and historically the worst of it has always been from white folks – from the overt violence of beatings and murders (claiming self-defense) to the institutional discrimination perpetrated by those holding disproportionate power. We are over forty years removed from the civil rights movement. We are in a different era, however tragically with similar outcome. Violence and fear build up on all sides, polarizing and feeding a vicious cycle. The fact that neighborhood watch captain, George Zimmerman is still walking free after murdering young, unarmed Trayvon just because he was black is a clear illustration of the persistence of American racism. This is an outrageous insult especially to African-Americans, but also to anyone who believes in equality and justice. It has been over 25 days since this incident and I can only hope and pray that after gaining national attention that a thorough investigation is carried out with impartiality and integrity. “Martin was shot in Sanford, Florida, nearly a month ago after a confrontation in a gated community with a neighborhood watch volunteer, George Zimmerman. Those were the cruel words my father-in-law, Dr. Little, heard when he was a young man at a public golf course in 1959. He left his cash on the counter, turned around, and walked out the door to go play a round of golf. Later, he and his friends were escorted away by police for playing on a “whites only” course. Rather than exploding into a violent rage, as many others would have done, Dr. Little stayed calm and held his head high during his arrest. That highly publicized event and his example of a dignified man were instrumental in the future of the golf course, which would be integrated a few years later. 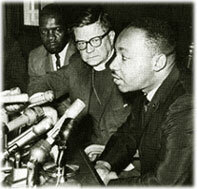 On MLK Day, I find myself reflecting on my father-in-law’s story. 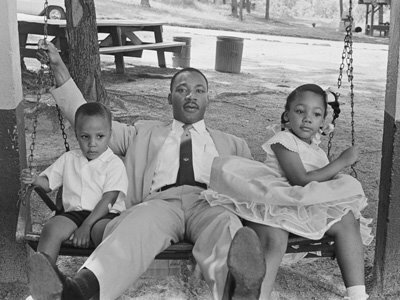 I am also reminded that Dr. King’s famous “I have a dream” speech was about being a father. It was about envisioning the future he wanted for his children, and then working to make that dream a reality. “I have a dream that my four little children will one day live in a nation where they will not be judged by the color of their skin but by the content of their character,” he said. More important than a man’s circumstances—his race, his socioeconomic status, his custodial or marital situation—is the way in which he handles his circumstances and envisions the future. Do you model self-control? Do you remain calm and rational, even when others are becoming bitter … perhaps even violent? Can you hold your head high because you know you are acting like the dignified man you want your children to see? Do you communicate to your children that the world is a good place and that the future is bright and colorful? Or do you act as though the world is a bleak place to live? When I think about what other fathers—black, white, Asian, Latino, poor, rich, married, divorced—have been through, I am motivated to hold the mantle just as high and to walk with dignity. I am reminded to be mindful about what my children see through my eyes and how they envision the future. What are your deepest longings for the world in which your children grow up? How do you want them to see you? The future? Let this holiday be not just about civil rights, but also about Championship Fathering. Tell your children what you dream for them. Today, I’m convinced he was right. Carey Casey is the CEO of the National Center for Fathering, a nonprofit organization dedicated to changing the culture of fathering in America by enlisting 6.5 million fathers who to make the Championship Fathering Commitment. NCF believes that every child needs a dad they can count on, and uses its resources to inspire and equip men to be the involved fathers, grandfathers and father figures their children need.